Paris-Brest-Paris, the pinnacle of amateur cyclesport, boiled down into forty-four text messages of at most 144 characters each. High points in green, low points in red. Now this is a ride report that isn’t too hard to get stuck into! 1am. So much for getting rid of my sleep debt! 23:11 Last chance not to forget anything for #pbp2011… Nope, think that’s it. Argh! 23:48 Ok… Off to bed for the last time before #pbp2011. So much for an early night again! 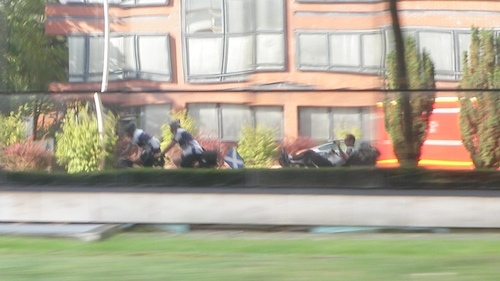 16:50 enroute to #pbp2011 – can he get on to the very British rail network? 18:00 … So far, so good! 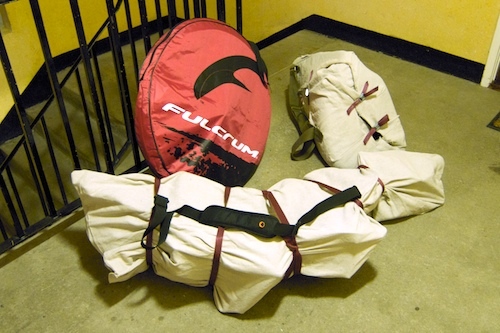 Suspicious train guard evaded. 09:00 Languishing at only 190mph on #eurostar. Makes #britishrail look a bit embarrassing really. 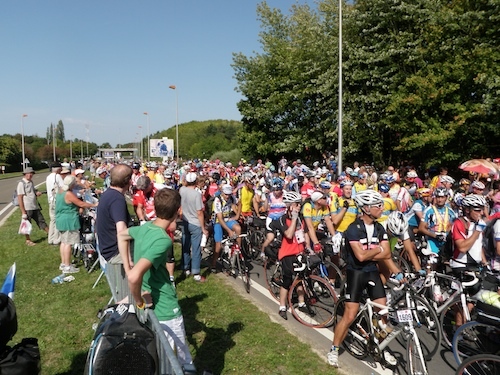 14:19 #pbp2011 – j’arrive! Now ‘just’ the 1200km to get back here! 20:45 Sacre bleu! My impeccable high school french accent is fooling nobody at #pbp2011! 13:15 Roasting hot at bike check #pbp2011. Hope it’s not like this in the week! 21:07 Artisanal pizza and tres cher lager biere at sosta bar, #pbp2011 . Genial! 05:26 Enormously epic thunderstorm at #pbp2011. Slept like a log though. Wetter than #pbp2007? 11:09 All at campsite studiously re-re-packing. Shockingly hot and humid again. More thunder tonight? Still, everything’s dried off already! 11:31 Meal in 3 hours then proceed straight to ‘go’! Getting nervous now! 13:50 First of the fast boys are lining up. Some pretty minimal bikes on show. Scorching. 110% humidity. 16:10 Official meal quiet. Giant portions, feel sick! Soon to be en route though- little bit over an hour. 16:12 30 degrees, windproof reflective gilet. Four hours to sunset. Surely not! 03:15 First control. Feeling pretty wasted. At the front of the bulge i think ? Need to get turned around. 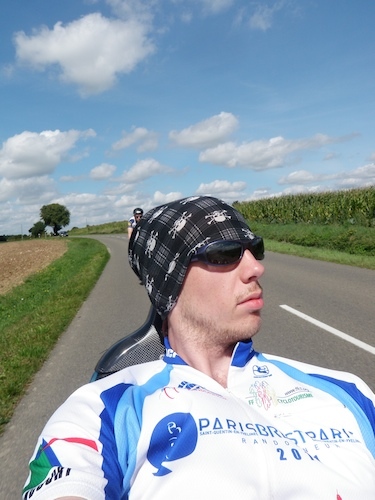 15:15 Loudeac, 480km. Knees mostly ok and 9 hours in hand. On for sub-70 obviously (ahem!). Suddenly roasting again. 15:27 Drat. Sleep. 44k to st nic but ~1730 too early. 76k to carhaix, but ~1930 also early. 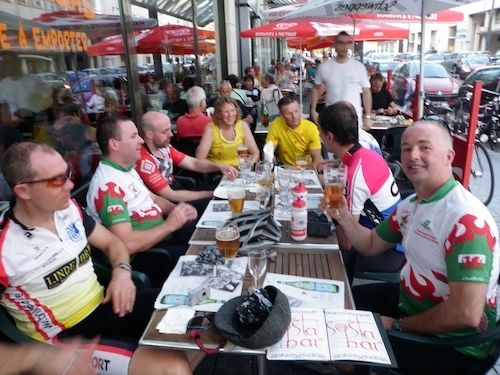 Not going to brest in a day or ride in dark..
21:10 Can the intrepid audax ecosse posse make brest before sleeping? 03:15 93km, 6 hours. Terrible riding. Worst. Decision. EVER. 06:51 Well, on the bright side, only 600km to go. Also the downside. Legs feel good for about 6km at a push. 06:53 Scenes of great suffering at Brest. Even the sun is not rising as it seems it should. 16:05 Frites, crepes et cafe at some place I know not where, en route to loudeac. 18:05 Replan working well just now. No queues at loudeac. 18:07 Lesson learned. Instead of riding off through the night for sleep, sleeping here then riding into the night. Thanks to the things. 03:04 It’s all going off. Loudeac to tinteniac in ~3 hrs including the secret control. 85km. Not sure what’s going on, not complaining. 06:33 Fougeres. Flaked pretty badly at the end. 7 hours in hand still. Might sleep but busy. Big effort for a surprise sub 80? 10:13 On a wall somewhere in the sun, sampling the baking. Wishing paris was a bit closer. Although at least it’s not getting further away. 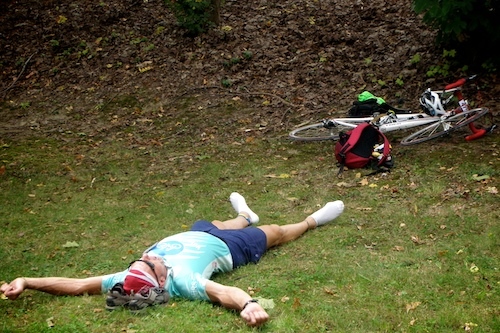 12:00 Narrowly avoided certain death with a spot of recumbent cyclocross. Not an ongoing risk fortunately. Otherwise tres bon. 12:18 We need to average 9.4 to finish in time, but 18.5 to in sub 80. Nobody is sure what to do. There are plenty of hills left, too. 17:59 80km in 5h30 with exploding knees. Mortagne. Still 7.5h ahead of the chop and 17h to get the last 140k in the bag. 18:03 XXL harsh. Ruined husks of men litter the verge, controle, road. never subjected to 90h hell, don’t, or do it with people in worse state than you! 23:40 Knees very bad. Got it in the bag though- 5 hours sleep then off to find a cafe near the finish to wait and torment the statistitions! 05:56 Morning coffee, croissant, ready for the last leg. 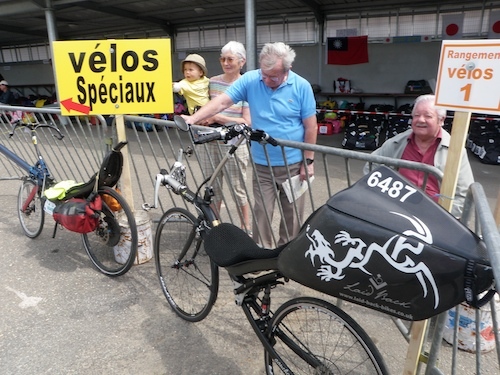 Definately in dreux contrary to the #pbp2011 website. Bon courage tout les monde! 10:17 Argh! Failed by ~30 minutes to join the 89 hour club. 88:20 something I Think. FINISHED. Still got one leg that works, too. 17:45 Feeling a bit anticlimatic without a control to chase! 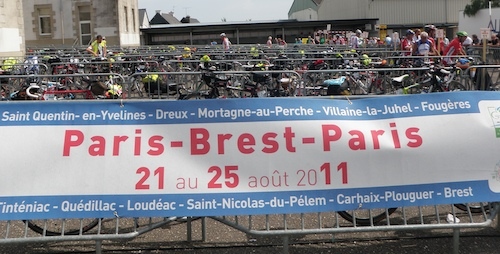 Is it really 4 years until #pbp2011 becomes #pbp2015? Tres …er.. what’s next?? Cereally, good onya for gett’n er done. In 2011, I’ll be 71 and seriously thinking of giving it a go. In the meantime: Ride Long and Prosper. Oh wait. You did.